Anne is the Paralegal for Stecklein & Rapp assisting with client needs in every aspect of the client relation process with the firm. 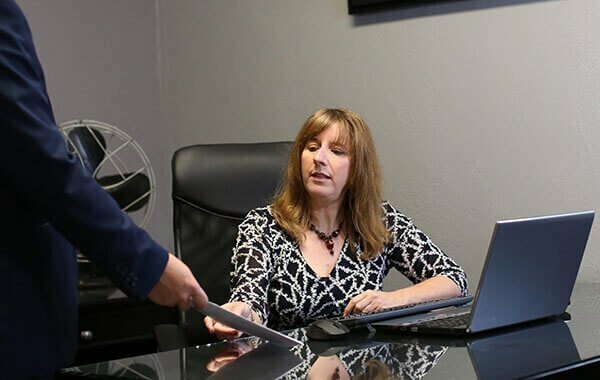 She has assisted Stecklein with cases since 2003 and is the person to go to if in need of signing paperwork or more information on cases. She’ll give you the insight on what to expect for each case, updates, discovery requests, answer questions, and help with investigating your case. She attended Kansas City, Kansas Community College with an Associate’s degree in Paralegal Studies as well as the University of Missouri-Kansas City from 1980-1985 with an emphasis in English. Before working as a Paralegal, Anne was an investigative reporter for 20 years at the Kansas City Star and has been awarded from the Kansas City Press Club for investigative reporting about the Wyandotte County District Court, and for deadline reporting about a man accused by the federal government of being a guard at a Nazi concentration camp. A native to the Kansas City area, Anne grew up in Platte County, Missouri and in her free time she is a ceramicist who enjoys making jewelry and outdoor sculptures.